I’ve been working for the Abaca agency for 17 years, which has its headquarters in Paris and an Abaca USA branch in New York. 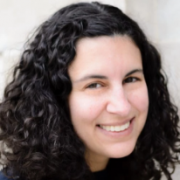 I’m the Los Angeles correspondent, where I’ve lived for 14 years. I started with sport, which I love, but I’ve been doing mainly entertainment for years now. It was purely thanks to a lucky set of circumstances that I started doing show business. Every year, I cover the Cannes, Toronto and LA Film Festivals, the Golden Globes, Oscars, MTV Music Awards, Grammies, opening nights, and everything surrounding show business in general. There’s always work. 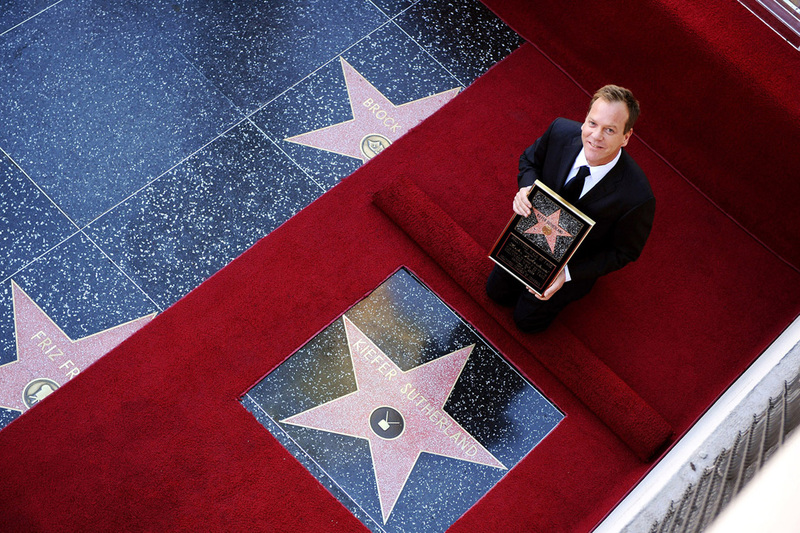 Kiefer Sutherland honored on the Hollywood Walk of Fame, LA, USA. What’s the procedure for doing what you do? You need to be well established in the field for a while, to be well-known. If I were new, it would be really hard; it takes at least a couple of years of investment. There are a large number of photographers at the moment and there is limited room for anyone new. Producers and press offices contact you directly. I subscribe to Hollywood News Calendar and Entertainment News Calendar to keep myself informed. For big events like the Oscars, you apply for media accreditation two months before the event. Your application may be refused, for lack of places for example; it also depends on the relationships you’ve built up over the years. Once you’ve obtained accreditation, you turn up at the set time at the press office, which has a map with the positions marked on it, and you take up the position they decide for you. What are the most sought-after photographs? Our work is directed above all towards women’s publications, whose logic you have to follow. Often, whilst we are working, the press agent informs us about the designers being worn; it’s very important to us. Like at fashion shows, you take full figure, portrait and jewellery shots, only in our case they are actresses. If an actress is pregnant, you have to make sure to show her fuller figure and new curves. Obviously, you also do other things, such as male fashion. There are actors who dress really well and others who do the opposite; Nick Nolte once turned up in a dressing gown. You take pictures of who is with whom, couples; you can ask certain people to pose together. Ben Affleck and Jennifer Garner have been together for a long time, they have three children, but on the red carpet they make separate entrances. I’ve only been able to catch them together a couple of times. Others come as a couple. Jessica Chastain, Cannes Film Festival, France. What difference is there between Europe and the US? The organisation: everything is really civilised in the US, and it’s starting to be that way in Europe too, it’s changing a lot. It used to be “You stand here” and then there was battle amongst the photographers; now, Paris and London are in line with the US, it’s almost too organised and there’s no spontaneity any more. They all pose at photo calls with advertisements everywhere. 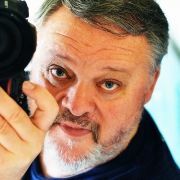 The main difference is that when I take a photo of a celebrity in the US, I sell it all over the world; when you work in Europe, aside from a few international celebrities such as Depardieu, the people are only famous on a national level. It’s more complicated, the market is reduced. I target the whole world, thus my interest in working in the United State. Candice Swanepoel, backstage Victoria’s Secret Fashion Show, NYC, USA. 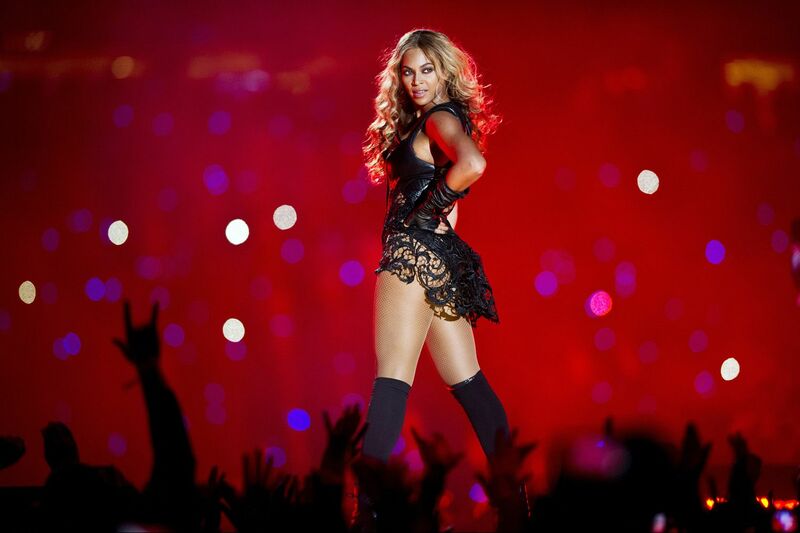 Beyonce, Half-Time Super Bowl Show, New Orleans, USA. What is your day like, in Cannes for example? You have two types of accreditation but without your ‘sur-badge’ you can’t do anything. With good accreditation you get good positions. You receive a daily programme via email: the first photo call is at around 10am, and you might even do eight of them. There’s no average duration time; the production team may have interviews and arrive late. If there’s any time cutting to do, it’s always the photo calls that lose out and we have to be able to squash it all in anyway: photos of everyone together, then the producer leaves, followed by the director, and just the actors are left, to be photographed together and individually. It’s all done very quickly. Then there are the red carpets, around three a day, that are done at the entrance and exit of the film showing, sometimes as late as 1am. The days are really long. Do you have a photo editor? I edit my own photos; I’m very quick at it. There is another photographer in my agency who is online; certain clients want the photos immediately and without him it would be a problem. There is a lot less archive work. I usually see more than a thousand images a day, too many. When you’re not taking pictures, you’re editing them. That’s how it is in Cannes, and maybe you get to eat sometimes. 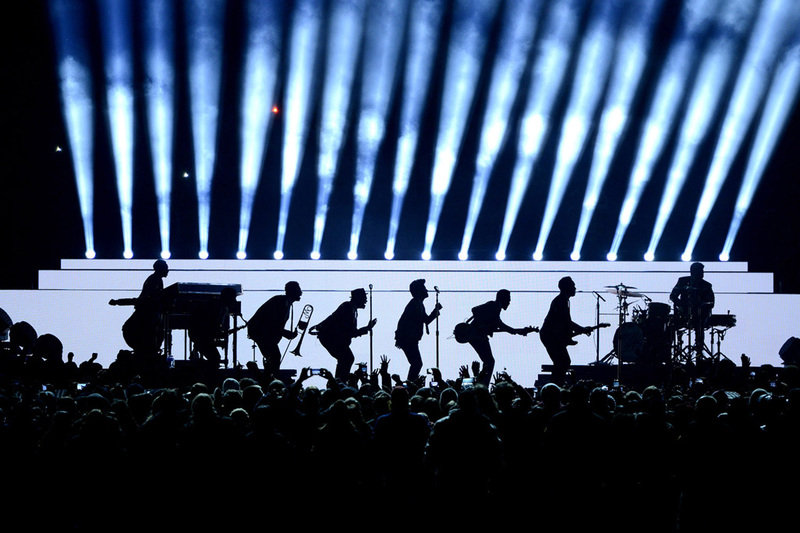 Bruno Mars, Half-Time Super Bowl Show, New Jersey, USA. How do you get started in this sector? It’s luck. The problem today is a general one; photographers flood the newspapers. I’ve seen the passage from analog to digital; when I took my first shots in LA with film, I produced around 400 photos, which was a lot, and then went to the studio and later scanned them. I would finish at 3am, and if I sent 25 photos, I’d done well. With digital photography, every photographer sends at least 200. Everyone wonders why the price of photos has fallen so dramatically, but it’s perfectly normal – when you have an enormous inflow of material, it becomes cheaper. There’s no going back, the profession has changed completely. What do you think of the red carpet selfies? I hate them. It’s my 15th Festival and it’s funny to see the difference in the public’s behaviour; I wonder whether they’ve come to take selfies instead of to see the festival. Even the celebrities take selfies throughout the red carpet events, but what can you do about it, about selfies and changing attitudes? Uma Thurman, Cannes Film Festival, France. 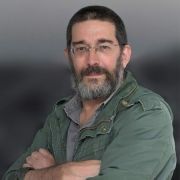 Learn more about Lionel Hahn and his work on Abaca website.